Etchings are original prints. This means that the image has been developed on the plate and is not a reproduction of an existing image.A limited number of prints are made from the etched plate, this is called an Edition. The number of prints in the edition is marked at the bottom of the image and the artist's signature guarantees the edition size.Etching is a very versatile method of printmaking. It can be as simple as a line drawing. It can be used freely, creating broad areas of colour, tone and texture. It can be extremely controlled. 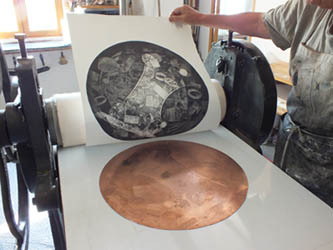 It can also incorporate most of the qualities of relief printing, lithography and screen-print as well as an enormous range of tonal, linear, colour, textural and other effects unique to itself. An etching is normally made on a metal plate. To print it, the surface is covered with ink and then wiped with muslin. The ink remains in marks that have been made in the metal by various means including the use of acid, scratching, polishing and engraving. Unlike most other printmaking techniques, the ink-holding marks on the plate can be altered. This means that the image can be changed and developed until image is completed.